Visualizing what you want is just one of the ways to create good things in your life. I've been working with this method for a very short time, this is where Stacie and Dawn come in. Dawn has been doing her own Vision Boards (aka Dream Boards/Goal Boards) for years and has been so gracious as to agree to lead us in this soulful adventure, and Stacie is going to help us with some breathing and meditation to get us in the mindset for manifesting our individual definitions of success! This workshop will be limited to 8 people so that we can keep this an intimate affair and to assist us that participate in doing our best work. RSVP will be closed on 1/2/2019. Come with an idea of your goals. We will all share with one another (as much as we are comfortable doing so) so that we can all assist in helping with narrowing down of specifics together. I know I am so much more creative when I have other women to bounce ideas off of! Your goals should be in any/all of the following areas: Physical, Spiritual/Soulful, Mental, Social/Emotional, Financial, or any other area the speaks to you. You know those magazines you've been hoarding for some reason? THIS IS THE REASON! Bring those with you. Ask your friends to donate their! The more pictures and words we have to choose from the more specific to our goals we can make our boards. You may even have some pictures/statements on Pinterest you want to print out! The magazine/pictures you choose should be something you can visualize yourself in or doing, you can: see it, feel it, breathe it, smell it, and touch it. 2. Poster Board, Journal, etc. for your vision board. Size is up to you, just be sure you have plenty of room. This board should go somewhere where you'll be focusing on it at least once each day, preferably at the start of your day. 6. Post It Notes~the brighter the better! Be Creative! This is for you, make it everything you want out of life! Bold, Bright, Energizing, or Quiet, Centered, Calm. This is your journey! You do you! Please feel free to bring food and drink with you! We will have access to a kitchen with fridge, microwave, coffee & water. As well as a copy machine, paper cutter, and other office supplies. Below is a link to a great Vision Board Resource that Jenny put together especially for WOA Members! 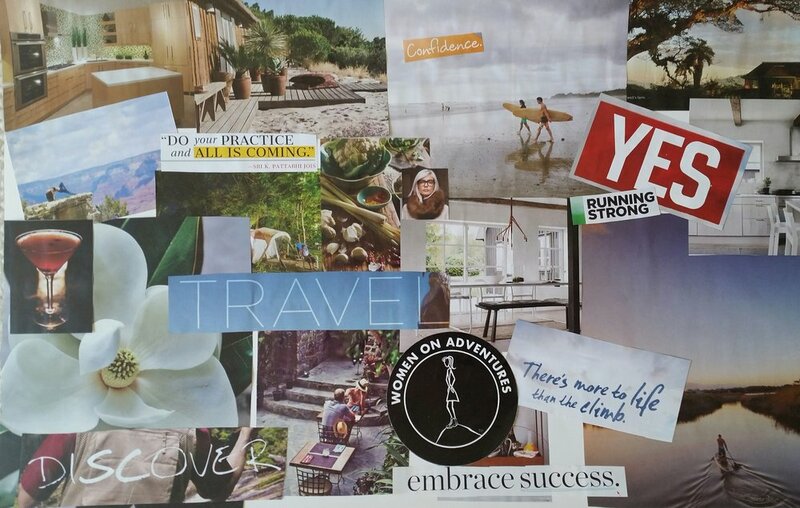 Grab our vision board guide! I'm excited to take this adventure of the heart and soul with you all! The location is Bobbie’s day job office.